Franklin, Wisconsin(March 7, 2019) – Routine Baseball, stadium name rights sponsor (Routine Field), have unveiled official uniforms for the home-team Milwaukee Milkmen. 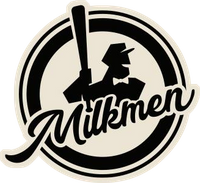 The Milkmen start their inaugural season this spring and summer. Founded in 2011, Routine Baseball is a baseball brand focused on apparel and accessories dedicated to celebrating baseball and the lifestyle that surrounds it. In addition to providing home and away uniforms for the Milkmen, Routine has collaborated with adidas on a new special edition, head-to-toe “Rally Cap” collection. Its look-and-feel is centered around the practice of turning a baseball cap inside-out to rally a team and fans for a dramatic come-from-behind win. The collection’s Routine Icon Trainer turf shoe will be the official on-field footwear of the Milwaukee Milkmen, designed specifically for the all-turf surface at Routine Field. Other items in the “Rally Cap” collection – as modeled by National League MVP Kris Bryant – include an Icon Bounce cleat, 5-Panel cap, hoodie, T-shirt, and socks. The “Rally Cap” collection has been a rousing success so far, nearing selling out within 48 hours of its initial release. Ballpark Commons is a $200 million mixed-used development featuring a 4,000-seat stadium (hosting the American Association of Professional Baseball league’s Milwaukee Milkmen as well as the UW-Milwaukee Panthers), commercial and retail businesses, restaurants, up to 212 apartments, and various entertainment and active lifestyle features including Luxe Golf Bays, a massive, three-level entertainment center with 57 heated open-air bays overlooking approximately 215 yards of turf, and the MOSH Performance and Wellness Village. Wheel & Sprocket was one of the first retail tenants announced. Phase one of the Ballpark Commons development is planned for a Spring 2019 opening. For more information about Routine Field and the Milwaukee Milkmen, visit www.MilwaukeeMilkmen.com. Founded in 2011, Routine Baseball is lifestyle baseball brand focused on apparel and accessories dedicated to celebrating baseball and the lifestyle that surrounds it. For more info, check out routinebaseball.com. adidas is a global designer and developer of athletic and lifestyle footwear, apparel and accessories with the mission to be the best sports brand in the world. As an innovation and design leader, adidas engineers the best in high-performance products to make athletes better, faster, and stronger and creates a range of classic and fresh lifestyle and high-fashion lines.